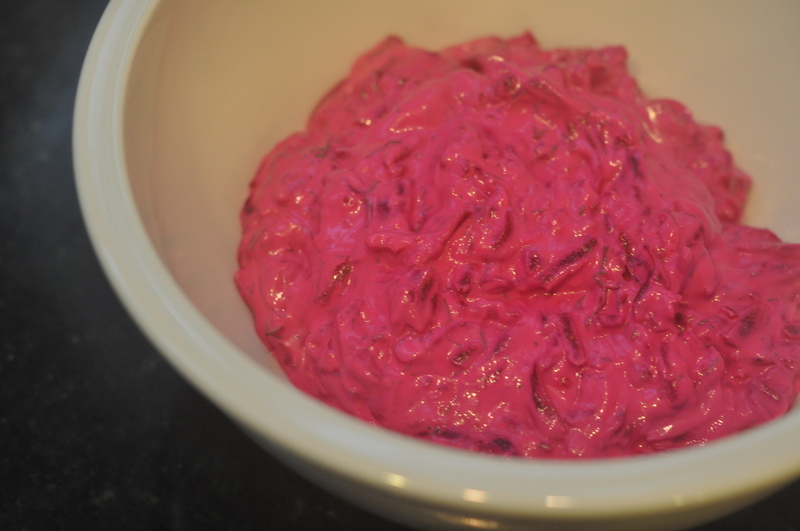 I love Ana Sortun’s beet tzatziki. Love it. Think about it when I don’t have any, which is most of the time. And then sometimes run over to Sortun’s cafe, Sofra, to buy some. Forget about The Professor for the moment, who has an aversion to dill. I could eat a pint of Sortun’s beet tzatziki straight. And actually, I might have, because I craved it when I was pregnant last year and eating … robustly. In any case, my CSA box from Siena Farms this week included beets and Ana’s tzatziki recipe! Now, at the very least, I’ll be able to satisfy my cravings without waiting in line at Sofra. And I might even be able to tweak the tweak the recipe (replacing the dill with a mix of parsley and basil maybe?) to make it more popular with The Professor. He does love beets, after all. 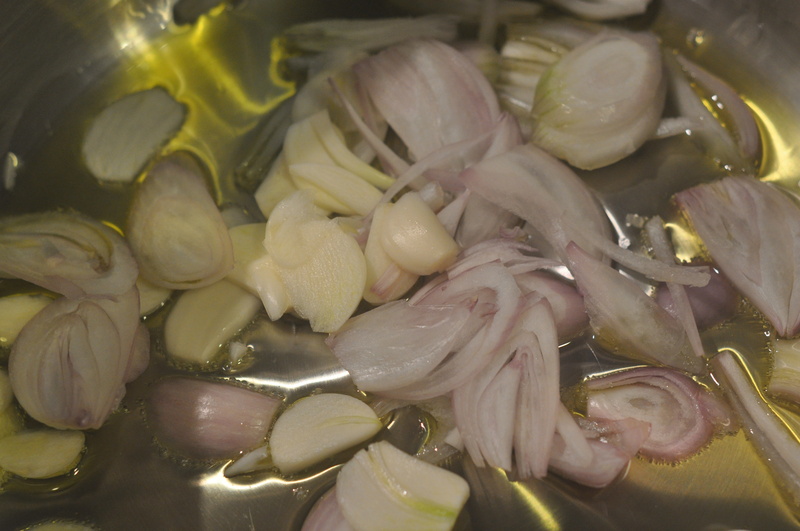 Combine the lemon juice, garlic, and salt in a bowl and let stand 10 minutes. Stir in the yogurt, olive oil, dill, and pepper. Fold in the beets and adjust the seasoning to taste. Serve cold or at room temperature. David Tanis’s new column about Pan-Roasted Spiced Cauliflower with Peas caught my eye. The recipe looks tasty and, unlike so many Indian or Indian-inspired dishes, it doesn’t involve a dozen spices and a spice grinder. Which is good because I broke my spice grinder (or, to be accurate, The Professor’s coffee bean grinder) making chick pea flour for last week’s Spinach-Chick Pea Burgers. In any case, I will definitely try Tanis’s recipe soon. Both The Professor and my almost-four-year-old like cauliflower, so I serve it fairly often — usually roasted. Though there was that Cauliflower Cake … and a pasta with cauliflower and walnuts that I’m trying to master. 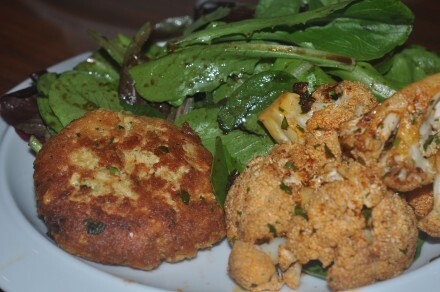 In any case, I’m still adjusting my recipe for chili-lime roasted cauliflower (which you can see below, served with salmon cakes), but look for a post on that soon. 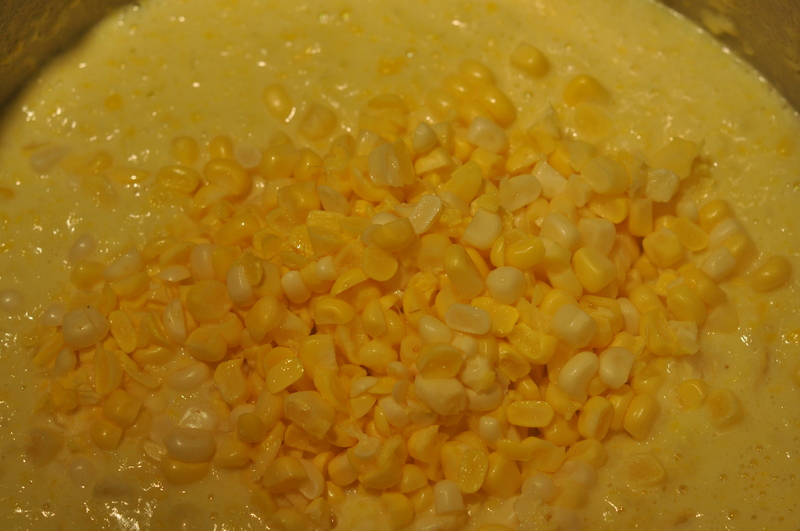 Yesterday I set out to make stuffed poblano peppers in chipotle sauce — and ended up with a corn salad. What can I say … my peppers didn’t cooperate, a mad dash to the grocery produced no more poblanos, and so The Cook played inventor. But let me start from the beginning. 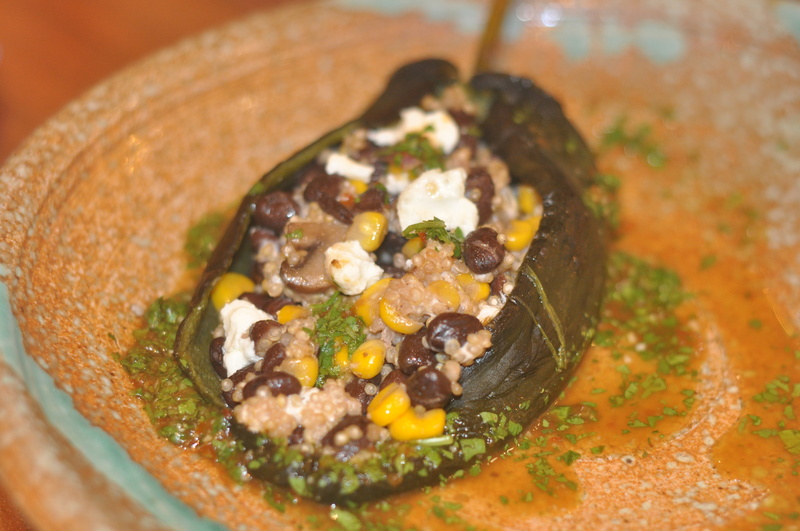 As you may recall, the poblanos are stuffed with quinoa, black beans, corn, and mushrooms. I’d made the dish once before and earned a B+. I was hoping my second effort would produce an A. 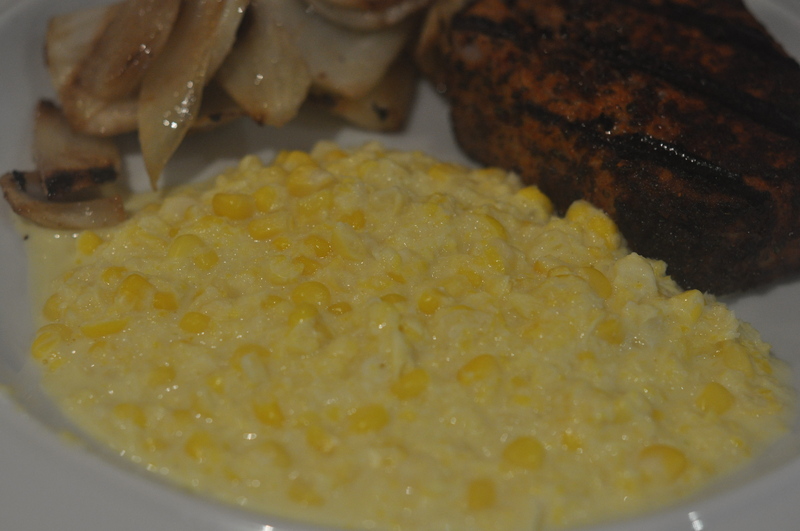 To improve my chances, I planned to serve it with the popular creamed corn. 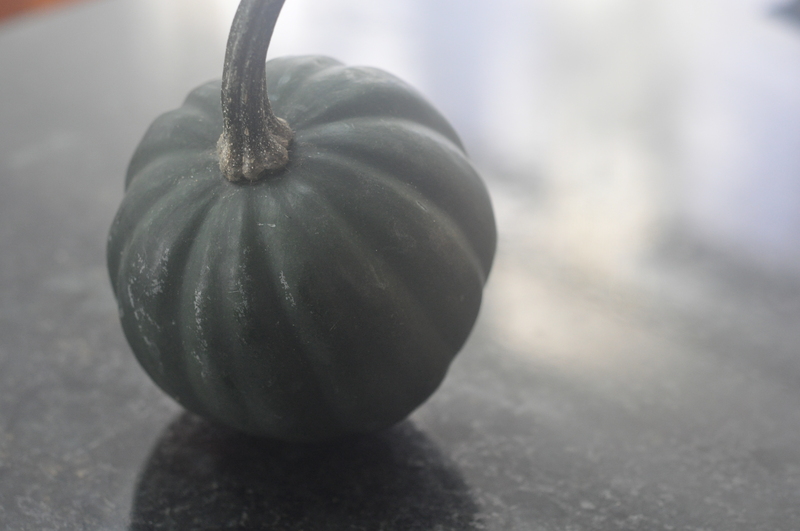 I roasted the poblano peppers, peeled them, and then cut a small slit in the side in order to scrape the seeds out. I don’t know if it was me or the poblanos, but my seed-removal efforts left the peppers with multiple rips and, I realized, in a truly un-stuffable state. So I improvised. I cut the kernels off of the cob. I diced some red pepper, some shitake mushrooms, and one of the poblanos; minced some garlic and sliced a shallot. While those ingredients were sauteing, I followed the very easy recipe for the chipotle sauce: puree one clove of garlic, one chipotle pepper, salt and water in a food processor; add cilantro and pulse once. 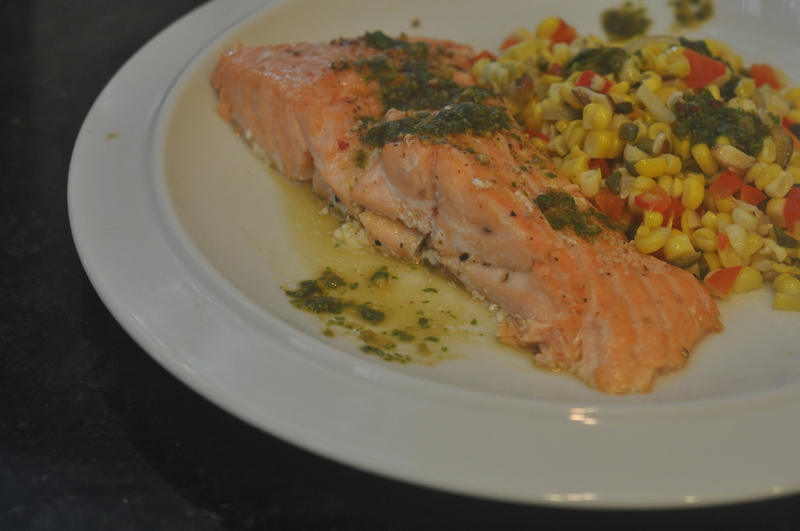 I served the corn salad with roasted salmon, drizzling both with chipotle sauce. 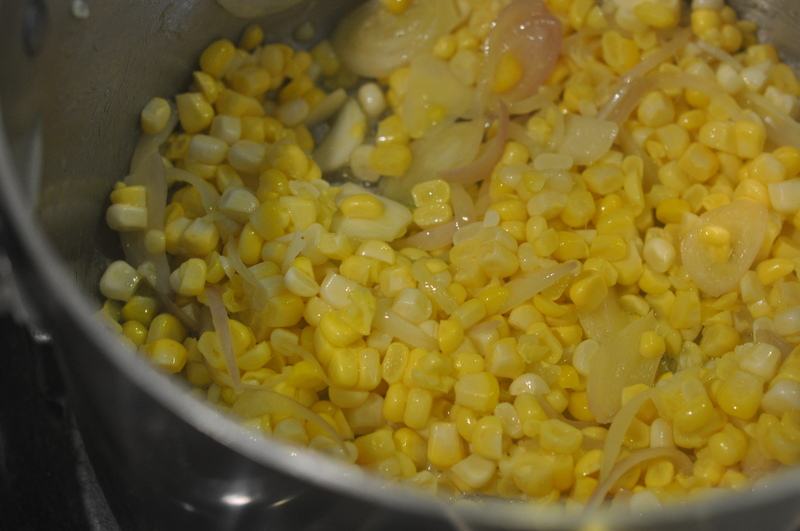 Maybe it was just relief that my poblano plans hadn’t ended in disaster, but I thought the corn salad was delicious. Next time (and by “next time” I mean tomorrow) I’ll add another shallot and perhaps some more mushrooms. And I might toss the corn salad in the chipotle sauce, treating it more like a dressing, But for a first-time, by-the-seat-of-my-pants effort, I was pleased. Of course, what *you* want to know is what The Professor thought. Well, he liked it. He thought the corn salad could have been warmer. And that, while the salmon was cooked perfectly, it wasn’t the best piece of fish. Given the quality of the salmon and the adjustments I want to make to the recipe, I didn’t ask for a grade. But look for one soon. Yesterday The Professor reminded me that it had been a while since I’d made Betsy’s Peppers — the red peppers, stuffed with tomato, olives, garlic and basil and then roasted. Given his initial suspicion of the dish, I felt a pleasant rush of yesIwasrightness, and decided to indulge his craving. “I have two red peppers and all of the other ingredients, so I could make them tonight,” I offered. “I might want more than two halves,” he responded. So I drove to the grocery to buy more red peppers. On the way I thought about the recipe and what to serve it with. The last time I had made the peppers for dinner, I’d thought of them as a side dish and paired them with a leek frittata and a salad. But once I realized just how much The Professor liked Betsy’s recipe, I started to wonder whether roasted peppers could be turned into the star of the dinner plate. 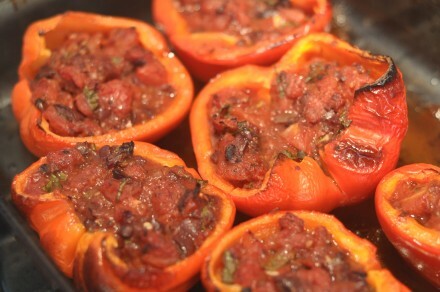 Since then, I’ve cooked two different recipes for stuffed red peppers and served them as entrees. (You can read about those efforts here and here.) Now was my chance to give Betsy’s Peppers a shot at entree status. I devised a two-pronged strategy. First, I served the peppers with polenta mixed with a generous amount of Parmesan cheese. I also made two additions to the recipe. 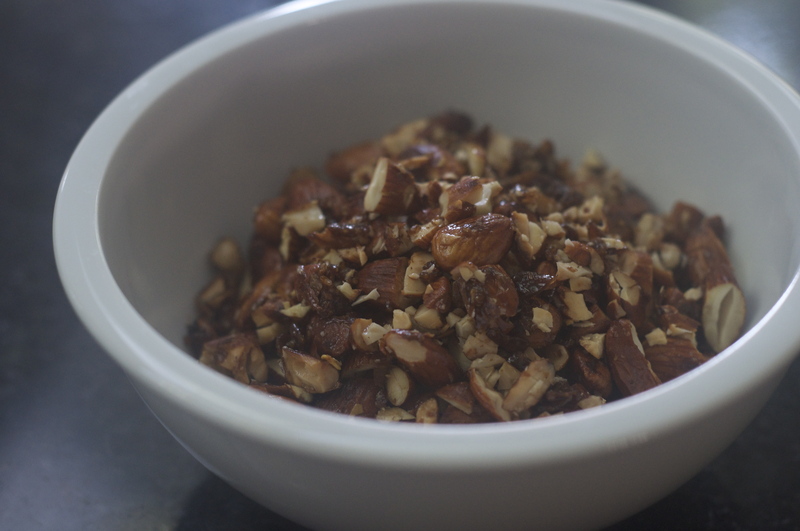 First, I added toasted pine nuts to the stuffing mixture. 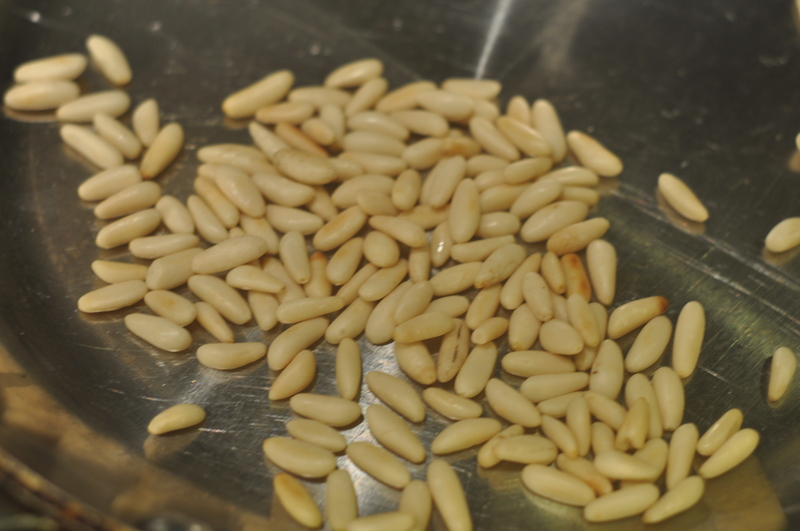 Partly because my going-on-four-year-old loves pine nuts and I thought it might encourage her to eat more. 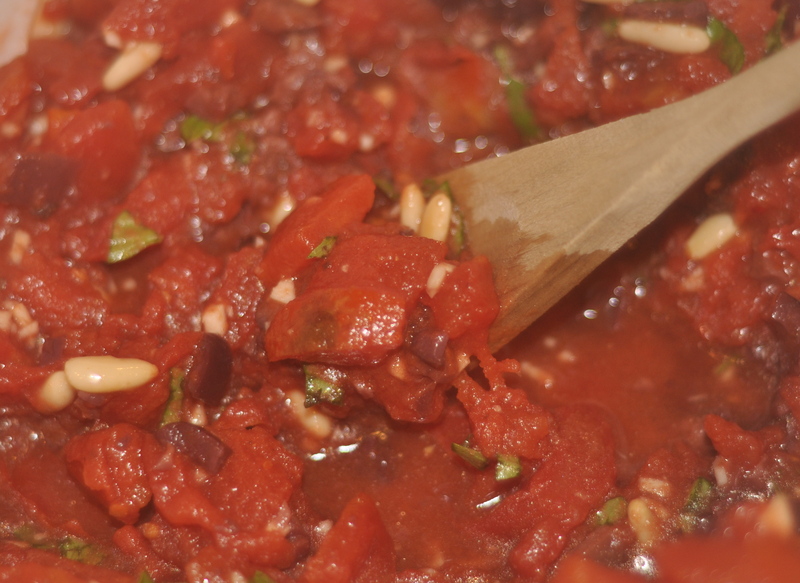 And partly because pine nuts, olives and garlic seemed like a classic Italian combination. 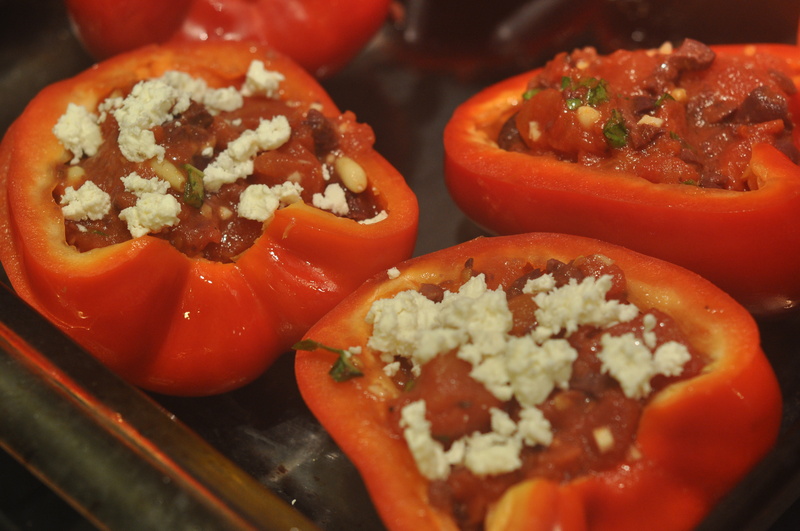 Continuing the Mediterranean theme, I sprinkled feta on top of the peppers just after removing them from the oven. The peppers alone, he said, were strong on taste and interestingness. But he felt they lacked on substance and gave the overall meal a B+. “The chick peas in Giada’s peppers made them more substantive,” he said. I reminded him that he’d described Giada’s peppers as “kind of bland,” but I took his point. And, to be fair to Giada, the feta idea had been hers. So I’ll consider chick peas. Maybe that will push the meal of Betsy’s Peppers and Polenta into A- territory. Our lilac is blooming. A small basil plant has taken up temporary residence in a sunny spot on our kitchen island, waiting until it is warm enough to move outside. And it’s raining. In other words, spring is here! 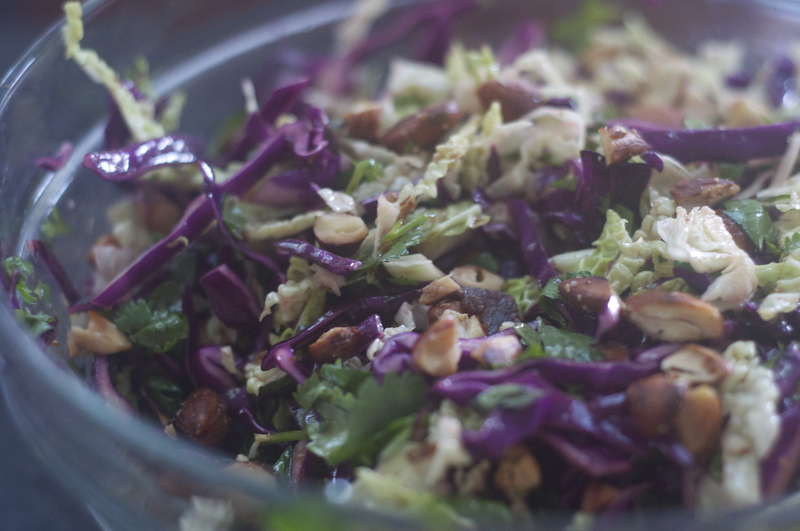 Over at The New York Times’ Sunday Magazine, Mark Bittman recently offered a dozen recipes, with options for steaming, roasting, grilling, and stir-frying. Some of his suggestions seem worth trying — steamed asparagus served with home-made aioli or a fried egg, for instance, or asparagus roasted with carrots and drizzled with soy sauce. But none of the twelve feel substantial enough to be the main course of a vegetarian meal. Deb, the cook and writer behind the lovely blog Smitten Kitchen, has a recipe for Ribboned Asparagus Salad, and I’m dying to try it. The salad isn’t main course material, but she also offers a recipe for Shaved Asparagus Pizza — a dish The Professor will be sitting down to soon. Over at food52, a recipe for Absurdly Addictive Asparagus rose to the top of the site’s Your Best Asparagus Recipe competition. The recipe calls for cubed pancetta, though I’m going to try a vegetarian version. Do you have a favorite asparagus recipe? If so, send it to me. In the meantime, I’ll be cooking up Deb’s asparagus pizza and will let you know what The Professor thinks of it. Mark Bittman actually calls the recipe “Roasted Carrots with Scallion-Ginger Glaze,” but words aside, the carrots were delicious. Packed with flavor and easy to make. 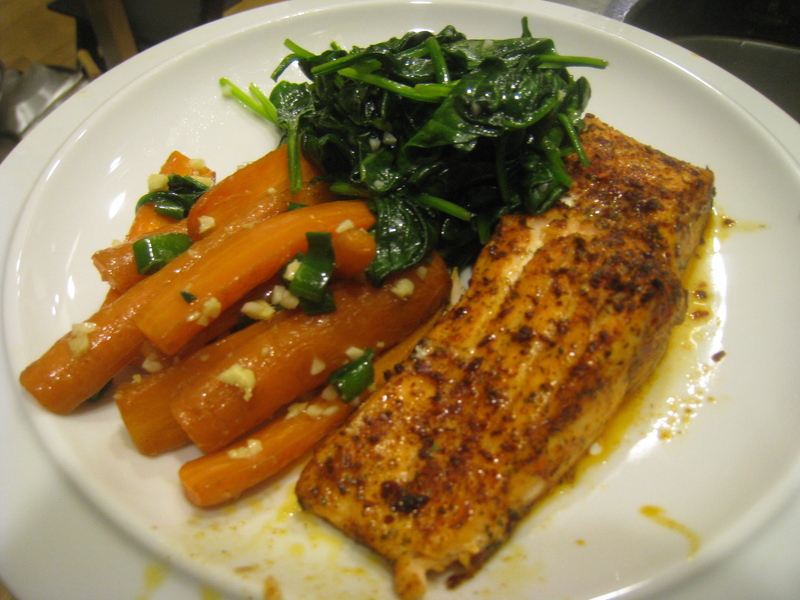 I served them with a simple roasted salmon and spinach sauteed with olive oil and garlic.